USED OR OPENED OR UNPACKED. you shall install the SOFTWARE on multiple computers. not have any third party do so. include the copyright notice on the back-up copy. anyone other than the original user of the SOFTWARE. this Agreement by destroying the SOFTWARE and any copy thereof. are implied or permitted under this license. computers, monitors, printers, fax, machine, copiers, and scanners. This model doesn’t provide setting options for power management. Copyright 2011 by CANON ELECTRONICS INC. All rights reserved. sales region of the Document Scanner. • Canon and the Canon logo are registered trademarks, of Canon Inc.
OF USE OR NON-INFRINGEMENT. CANON ELECTRONICS INC. THE MAXIMUM LIABILITY OF CANON ELECTRONICS INC.
OF THE PRODUCT COVERED BY THE WARRANTY. If any of the items listed below are missing or damaged, contact your local authorized Canon dealer or service representative. 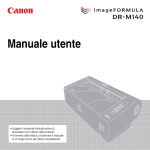 • Items included in this manual are subject to change without notice. • You must keep the machine’s packaging and packing materials for storing or transporting the machine. • For Europe, a print version of Reference Guide is supplied in English. 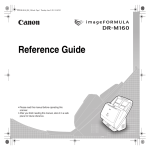 The content of the Reference Guide can be found in other languages in the User Manual on the Setup Disc. • The shape of the power plug varies by country and region. This is a dedicated scanning application for this product. This is a scanning application for the DR series scanner. This is the scanner driver for this product. Nuance Communications PDF creation/editing software. 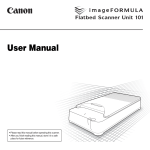 After taking the scanner out of the box, remove the protective sheets (▼) from the scanner. Drive capable of reading DVDs. that is compatible with the above operating systems. manufacturer of the computer for more information. • Use the USB interface provided as standard with your computer. interfaces, even if present as standard equipment on the computer. For details, consult your local authorized Canon dealer. greatly reduced and transmission may take a long time. contact your application software retailer. scanning with 32bit applications only. applications are guaranteed to operate. • Install the software before connecting the scanner to the computer. • Log on to Windows as an Administrator. • Close all other applications before installing the software. the bundled software to install if you select [Custom Installation]. If the following screen appears, click [Yes] or [Permissions]. When the driver installation is complete, click [Finish]. Read the license agreement, and click [Yes] to accept it. 18 Select the language you want to use, and click [Next]. 21 Click [Exit] to finish installing the software. Connect the scanner to the computer and the power supply. • Do not connect the scanner to the computer before installing the software. • Before connecting the scanner to the computer, verify that the power of the scanner is OFF. If the power is ON, turn it OFF. button on the front of the scanner. (CaptureOnTouch) icon appears on the taskbar as follows. Press and hold the power button until the indicator goes out. should disconnect the power cord from the AC outlet for safety. The power button lights blue when the power turns ON. scanner will become ready to use. scanner will turn off automatically if it is not operated for 4 hours. Documentation for this scanner consists of the following manuals. when you first use the scanner. 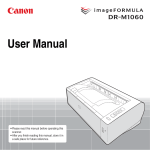 This manual contains the operating procedures of the scanner. 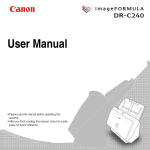 Disc as an electronic manual in PDF format. be registered to the following location when the software is installed. the scanner safely, always pay attention to these cautions. safety warnings and precautions described below. installed meets the following environmental requirements. use curtains to shade the scanner. as dust may adversely affect the inside of the scanner. such as alcohol or paint thinner. ● Avoid locations that are subject to vibration. heavy objects are placed on it. ● Do not use the power cord while it is coiled. power cord, grasp the plug and remove it from the outlet. power cord can be disconnected easily in an emergency. connected, the plugs and connectors may be damaged. do so may result in a fire or electric shock. ● Never connect the power cord when your hands are wet. ● Do not connect the scanner to a multi plug power strip. ● Do not take the scanner apart or modify it. ● Do not use flammable spray near the scanner. and disconnect the power cord from the power supply. ● Do not drop the scanner, or subject it to impact or strong shock. service representative to have the unit serviced. from the scanner and consult a physician. might cause a fire or electric shock. fall over, resulting in personal injury. on your region). Doing so might cause a fire or electric shock. cord's internal wiring, resulting in a fire or electric shock. will be unable to unplug it in an emergency. electric shock. Doing so might cause a fire or electric shock. scanner while you are using it, as this may result in personal injury. and laws or consult with the retailer who sold you the scanner. material when you place it in the packing box. enables documents to be scanned with high image quality. The scanner supports Hi-Speed USB 2.0. You can scan business or ID cards. grayscale, or black and white, and saves the image accordingly. and combine the scanned images into a single image. time, and scanning stops if a double feed is detected. panel is lit. 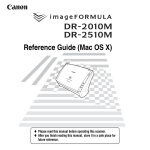 You can continue scanning by pressing the DFR button. enhance the text when both the text and background are light. These modes may not work, depending on the type of document. scanned image during black and white or grayscale scanning. is skipped for scan images judged to be from a blank page. needing to scan the document again. can use this function to adjust their thickness during scanning. fed at an excessive slant to prevent damage to documents. Raise this to open the upper unit. Scanned documents are output here. ensure that the document feeds straightly. holes, as doing so might cause overheating. Use this to change the way documents are fed. This lights during non separation feeding mode. Job No. displayed in the Job No. Indicator changes. Connect an anti-theft key chain or the like. This executes the job displayed in the Job No. Indicator. in the Job No. Indicator. : displayed when the upper unit is open. When using the straight path, scanned documents are output here. : displayed when a paper jam is detected. Connect the supplied USB cable to this connector. : displayed when a double feed is detected while scanning. Connect the supplied AC adapter to this connector. : displayed when a skewed document is detected. : displayed for other errors. panel, errors, and other information. displayed in the Job No. Indicator. : flashes during straight path mode. : animates during U-turn path mode. aligning the centers and leading edges of the documents. are fed one sheet at a time. • It is recommended that thin documents be fed one page at a time. document and then scan the photocopy. number of cards in the stack. • Use the straight path when scanning cards. depending on the type of embossment. scanner is closed, and the straight path is used when it is opened. scanner is lowered, and non separation feeding is used when it is raised. documents or folded documents without separating them. cards, place the cards at the top and use the straight path. of the scanner closed (U-turn path). selection lever to the standard feeding position (lower position). (one set in the case of bound or fastened paper). Open the document feed tray. open the document eject extension support. or cause a paper jam or scanner malfunction. disconnect the power cord from the power outlet to stop scanning. curled, it may cause a paper jam. stored, and then resume scanning the remaining document pages. to the scanner while it is not being used. your hand on the edges of the paper. plain paper (80 g/m2) can be loaded at the same time. Open the straight path tray. the U-turn path may damage the card. Save the file to a specified folder. can specify any of the following file formats for scanned images. CaptureOnTouch and display the main window. be selected according to the purpose and application. scanning. Refer to the User Manual for detailed information. repeat scanning using a set procedure. is kept as resident in the system. icon disappears from the taskbar. Place the document in the scanner. and become resident in the system again. The top screen of Scan First appears. Set the scan method in the top screen. when the scanning of the document is finished. When scanning of all the documents is finished, click [Next step]. When scanning is finished, the Output settings screen appears. when the output method is set to [Save to folder]. • Clicking [Return to top] returns to the main screen of Scan First. which the scanned images were saved. Enter the job name, and press the Enter key. The top screen of Select Scan Job appears. Click [Output settings], and configure the output settings. the output settings after scanning. scanning conditions, and then try scanning again. • Clicking [Return to top] returns to the top screen of Select Scan Job. pages of the document are scanned. scanner and then click [Scan]. match the document because scanning in full auto mode is enabled. display the required job number in the Job No. Indicator. Press the Start button in the operating panel. seconds after the output process finishes. For Select Scan Job, configure the scanner settings for each job. dialog box are applied for settings other than the basic items. Select from the following modes for scanning documents. Scans the document in color. Scans the document in Grayscale. Scans the document in black and white (binary). Specify the page size of the document. document is detected and the images are saved at the detected size. automatically from the content of the scanned document. Specify whether to scan only one side or both sides of a document. the document is skipped during scanning. advanced settings dialog box] check box. are detected and then straightened. are rotated so that the text is correctly oriented. images and then continue scanning. Drag thumbnail images to change the positions of pages. Displays the preview images of the scanned document. to fit the current window size. and returns to the top screen. Starts scanning of the next document. this output method, specify the printer for printing. output method, configure the settings for the image files to be saved. method, and configure the setting for the image files to be sent. see the help (click the [Help] button in the settings screen). Attaches the scanned images to new e-mail in the e-mail application. image files to be attached to e-mail. program of the operating system. SharePoint sites that use other authentication formats. Set the default paper size and click [OK]. See the “CapturePerfect Operating Guide” or help for details. Then click [CapturePerfect 3.1] followed by [CapturePerfect 3.1]. clicked in the [Select Scanner] dialog box. Click [Select Scanner] in the [Scan] menu. Click [Scanner Setting] in the [Scan] menu. Refer to the User Manual for detailed information. 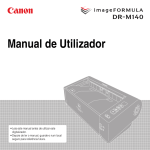 Select [Canon DR-M140] and click [OK]. 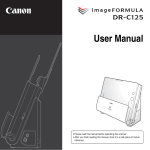 If [Canon DR-M140] does not appear, reinstall the scanner driver. Click [Scan Batch to File] in the [Scan] menu. 11 When scanning is finished, click [Exit] in the [File] menu. Raise the OPEN lever, and open the upper unit. The feed roller and retard roller are consumable parts. paper jams and double feeds may occur. displayed when the computer is started. details about the exchange roller kit. The location of each of the consumable parts is shown below. sure that it is completely closed. Unlock the roller cover and open it. Install the new retard roller. Close the document feed tray. Press the roller cover to close it. Remove the feed roller, detaching the left side first. Install the new feed roller, attaching the right side first. Slide the securing lever for the feed roller to the right. Lower the securing lever for the feed roller forward. Slide the securing lever for the feed roller to the left. 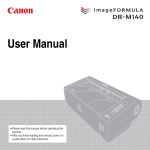 Click [Canon DR-M140 USB] and click [Properties]. 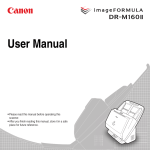 [Canon DR-M140], and [Canon imageFORMULA Utility]. Click the [Maintenance] tab and then select [Reset]. The counter for [Current Rollers] resets. Click [OK] to close the scanner properties. or another operation being performed. To disable this setting, follow the procedure below. automatically after 4 hours] check box. This section provides recommended solutions to common problems. The scanner will not turn on. The scanner is not recognized. the computer with a USB cable. work with all USB interfaces. (or [Deskew]) in the scanner driver settings. scanner driver setting is enabled. regardless of scanner driver settings. setting or create another job for duplex scanning. If white lines or streaks appear in scanned images. Clean both sides of the scanner glass, and the rollers. scratched. 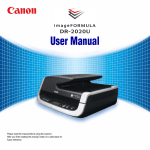 Contact your local authorized Canon dealer. and manually feed the scanner one page at a time. in a single JPEG or BMP (PICT) file. format, change the scanning [Color Mode] to either [24bit Color] or [256-level Gray]. multi-page TIFF or PDF format. saved as a separate document. single image file, select [Multi Page (All Pages)]. Memory becomes insufficient and scanning stops. Through/Remove Background] if they are set to on. display panel and scanning is interrupted. following procedures to clear them. hand on the edges of the paper. was scanned correctly, and then continue scanning. scanned image before resuming the operation. Kit to replace the rollers (feed roller unit, retard roller). representative for detailed information about the replacement parts.